We are urgently calling all anarchist, anti-fascist and other anti-authoritarian left wing groups to act in solidarity with Jock Palfreeman (full story of his case is in the attached appeal below). Jock has already served several years of his 20 year sentence in Bulgaria. He actively works towards organising his fellow prisoners and highlights cases of repression by the prison authorities. He is one of the founders of the Bulgarian Prisoners Association. In the last few years, the response to his imprisonment and calls for solidarity with him from the anarchist and anti-fascist movement have been underwhelming. He needs more groups and individuals to join the campaign for his freedom. His family and some liberals have been organising support for him and trying to raise money for his fine; but Jock was always asking for a more direct kind of solidarity other than just politely asking the authorities to be nice. He needs people to not only constantly put pressure on the Bulgarian authorities in the form of letters and emails, but also organise demos and pickets outside embassies and/or any other Bulgarian institutions, generally spreading awareness about his case.Please keep publishing information about Jock on your blogs, websites and social media. We hope you will all join the upcoming International Week of Solidarity with Jock Palfreeman on 22nd-28th April, and use your creativity and imagination to express solidarity. Jock has now lost all his appeals and the only way left for him, is to appeal to the European Court of Human Rights. He is also trying to secure his transfer to Australia to serve his sentence, which is proving difficult as the Bulgarian prosecution service is determined to keep him imprisoned in Bulgaria. Authorities refuse to even discuss his possible transfer until his fine is paid, effectively holding Jock to ransom. Jock’s family is currently collecting necessary funds and you can donate by visiting the http://www.freejock.com. It is now more important than ever, that we collectively put as much pressure on the Bulgarian authorities as possible, to accept Jock’s transfer to Australia. 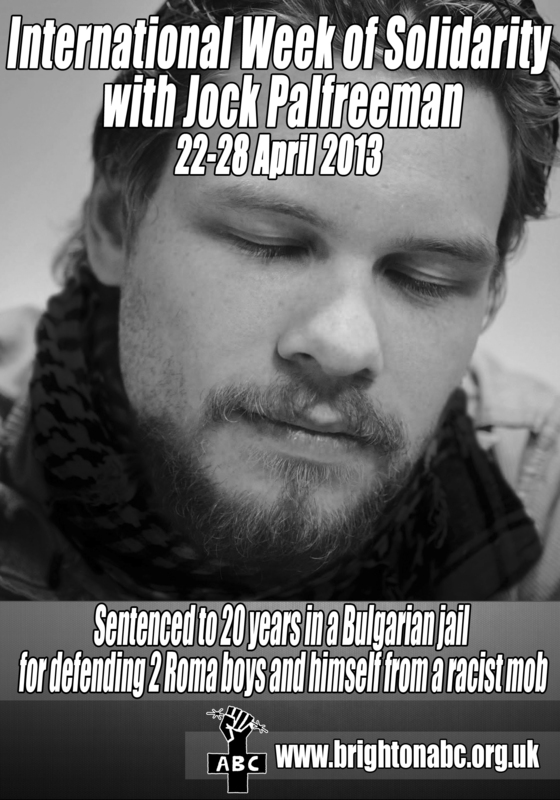 Between the 22nd and 28th of April 2013 there will be an, International Week of Solidarity with Jock Palfreeman. We need to let Jock know that he is not alone in his struggle and that we are in it for the long run. Any solidarity actions can go a long way to assure that. He recently helped create the Bulgarian Association of Prisoners (www.bulgarianprisonersassociation.wordpress.com) and because he is its Chairman, he suffers repression from the prison’s administration, such as a recent refusal of computer access to continue his university education, which pushed Jock into a 30-day hunger-strike. Jock needs us to act and he needs our solidarity. The more creative the actions the better. Don’t let the Bulgarian state bury this courageous man alive in prison! Don’t let them think that they can get away with it! Another important aspect is, especially for people in Australia , to keep the pressure on their government to do something for Jocks case. His case has been too quiet in his home country for far too long. It is time to change that! Organize solidarity actions outside Bulgarian Embassies, Consulates, etc. (for a list of the Bulgarian Embassies and Consulates please see, http://www.buldir.com/bulgarian_embassies_abroad.html). Phone/write the Bulgarian Embassies and Consulates with your protests. Help us to swamp the Bulgarian Authorities with letters of protest, condemnation and requests for Jocks appeal to be accepted. It is also vital that we send protest messages to the prosecutors directly responsible for blocking his transfer to Australia. (Please see below for a list of addresses). Ideally protest letters are best written in your own words….. BUT, we have provided a sample letter (attached) that can be sent if you do not want to write your own. Just print it, sign it and post it, simple as that. Please feel free to reprint it and distribute it to anyone you think may send a copy. We need to get the pressure up, and keep it up! Tel: +359 2 971 1408. OR +359 2 971 3778. OR +359 2 948 2218. I am writing to you regarding the Australian national Jock Palfreeman. Mr. Palfreeman is currently imprisoned in Sofia Central Prison in Bulgaria. After defending two young innocent boys from a viscous attack by a group of drunken football hooligans; and later being forced to defend himself against the same assailants, he was sentenced to twenty years incarceration under charges of murder and attempted murder. He is clearly only guilty of accidental homicide in self-defence. Mr. Palfreeman witnessed a gang of around 16 men, attacking the two boys and ran to their aid. While trying to keep the gang at bay he suffered a viscous attack and was left with no choice but to defend himself. His version of events has remained consistent since the night in question and is supported by numerous witnesses. All of whom are prepared to testify in his defence. It has since transpired at his trial, to my astonishment, that key people and possible witnesses were never interviewed by police, that the CCTV footage from the scene went missing and that many of the peoples statements submitted to the court by the prosecution were not the same as the statements made on the night in question. Anything favourable of Mr. Palfreemans’ defence was completely disregarded by the judge whilst the prosecutions case was built on the witness statements made by the football hooligans that initially attacked the two boys. All claiming that Mr. Palfreeman randomly attacked them and chased them with the intent of killing somebody. The trial was a farce, as so were all appeals. I ask that the Bulgarian Authorities stop their attempts to keep him imprisoned in Bulgaria, and allow him to be transferred to an Australian prison where he can be closer to his family. We will continue highlighting Mr. Palfreeman’s case and showing our solidarity with him, until our requests have been satisfied. Mr. Palfreeman selflessly saved the lives of two young boys, risking his own safety, at the cost of his own freedom. He should be deemed a hero, not deemed a cold blooded killer!